I’ll start this blog off with a question: When was the last time you found yourself in a challenging situation? Think about it…what obstacles have you faced recently that really made you dig down deep to find the courage to deal with them, and then to take responsibility to do what needed to be done? In my own personal life, it seems like I’ve been getting obstacles thrown at me every which way these past several months. Some related to health, some related to my full-time job, some related to my personal relationships…I could go on, but I think you get the point. It’s the way that I’ve dealt with these challenges that matters. I have to admit that the majority of the time, my reactive nature wins out. More often than not, when I react impulsively, I end up disappointed all around. But when I take time to really think about the situation and try to find the opportunity being presented to me, THEN it starts to become something else completely. When I can approach challenges with fearlessness, when I take responsibility (for after all, it is MY life, isn’t it?) and let go of my ego, wonderful things tend to happen. When I am not so reactive, when I’ve done my best to make the most of the situation, it’s so much easier to deal with the end results without letting my emotions get in the way. And I notice that when I approach challenges in this way, I am much happier in life. Dhanurasana (Bow Pose) is a great pose to practice this concept on our mats. Dhanurasana is a deep backbend (as you can see in the picture above), and it’s extremely challenging in this pose to find the right amount of extension in the spine. Too much extension, and you end up feeling “crunched”, particularly in the low back. Too little, and you won’t have the proper support or foundation to lift the thighs up. Many people tell me they don’t like this pose, and when I watch them getting into the pose, I usually notice either too much or too little extension in the spine. Backbends are meant to provide a stretch for the front body, while strengthening the back body…it’s a balance. If you’re feeling an intense stretch in your low back while in this pose, then that’s your indicator that you’ve gone too deep. Instead, find the balance. Find that spot in the pose where you feel like your spine is lengthening and extending, where you feel the opening in your chest and shoulders, while feeling your whole backside (upper back, middle back, lower back, glutes, and hamstrings) strengthening. It should feel equal in terms of intensity, both from the flexibility and strength aspects. We’ll be practicing Dhanurasana in our classes this week, learning how to find that balance. Learning how to apply JUST the right amount of effort. Maybe, if we can learn how to do this in our practice on the mat, we just might find that it becomes a bit easier to put this into practice in our lives off the mat. Hey everyone…a reader contacted me recently and asked if she could contribute an article to this blog site, as she is relatively new to yoga and is loving discovering all the wonderful things it has to offer. Enjoy! And thank you, Carolyn, for doing this…I look forward to many more articles from you! One of the coolest – and most intimate – experiences in my entire life was my first yoga class. Yoga? Me? No one was more pleasantly surprised than I was. I’m a self-professed adrenaline junkie – I simply love the buzzed high I get from my weekly kickboxing and spin classes. I get pumped up at the mere thought of hard-core instructors driving everybody in aerobic unison in our collective quest to get super-duper fit! But who knew that deep breathing, stretching poses, and silence amongst a group of strangers would be equally exhilarating? I’m still learning the language around yoga – distinguishing asana (a yogic pose) from prana (Sanskrit for ‘life’) – so forgive me if I fumble while describing how my new fitness passion began! While I was always curious about yoga, a near tragedy made me give it a hard look. A year ago, my kickboxing partner Alyssa, had told me her doctor recommended yoga as a part of a weight loss program. That protocol surprised me, but a recent study from the American College of Sports Medicine in San Francisco found that participants in an eight-week adapted yoga program exhibited improvements in balance, flexibility, walking (both in strength and quickness of step), and overall endurance. I started to notice that Alyssa seemed to prefer yoga OVER kickboxing. Her posture was better, her outlook on life was so positive, and not only had she lost weight, she retained her muscled appearance. Orthopedic surgeon, Dr. Glen Axelrod of states, “Many professional athletic teams use yoga as an integral part of their training.” Could all of this be from yoga? After a bit of research, it seemed that the benefits of yoga are endless. Dr Mehmet Oz, himself a yoga enthusiast – cites lymphatic stimulation (cleaning blood of waste materials) and the loosening of muscles and joints to better handle the weight of our bodies (and thereby building muscle tone and strength) as key reasons to give yoga a go. I finally had my first class (with Alyssa, of course). It was a profoundly rewarding experience. Everything from the right clothing and shoes to the names of the poses felt like a whole new world, and one of silence to boot! I still cannot get over how serene and calm a group of strangers in an exercise room with mats and towels can be. At first, I thought I’d be embarrassed because I was a newbie, but as soon as I realized everyone was in their own internal space, I stopped worrying. Forget spinning: I don’t think I’ve ever breathed as deeply as I did on my yoga mat. My head was almost dizzy from it; I jokingly looked at Alyssa as if to faint. But I did complete the class. Since then, I’ve been to two more classes, and progressed to daily sessions on my own. It is just the right complement to my rigorous fitness regimen, and provides the quiet ‘me’ time I didn’t know I was looking for. Carolyn Fallon is a 20-something year old with a passion for life, fitness and overall well being. She is an avid spinner, healthy cooking enthusiast and lover of life. Check out Carolyn’s blog at http://fullonfit.blogspot.com! 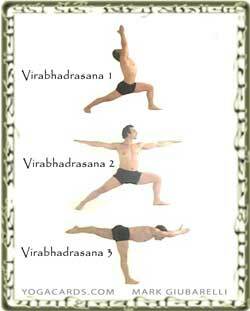 If you’ve ever been to one of my Vinyasa, Hatha or Power yoga classes, then you are familiar with Warrior poses. In most every class, we at least practice Warrior 1 and Warrior 2. We don’t always get to Warrior 3, but I love when we do, because it’s such a great strength and balance pose, in my opinion. You know, every pose we do in yoga has a purpose, and the Warrior poses are no exception. I love reading about the history behind each pose, because there is usually some life lesson I know I’m meant to absorb. Recently, I purchased a book called “Myths of the Asanas: The Stories at the Heart of the Yoga Tradition”, by Alanna Kaivalya & Arjuna van der Kooij. In this book is the story of the Warrior poses, which I chose to read about this weekend, and damn if it didn’t hit right where I needed to be hit this week! If you’re not familiar with the story, here’s a great link to a really good version. But to sum it up, Lord Shiva created Virabhadra (the great warrior) out of one of his own dreadlocks in a fit of rage over the death of his wife, Sati. Shiva ordered Virabhardra to kill Sati’s father, Daksha, as he assumed that it was Daksha who had killed Sati. However, this was not the case, and when Shiva realized this, he set things right by bringing Daksha back to life. The point of the story is to teach us that life isn’t always what we want it to be. Sometimes, it gets hard and we need to make some very tough decisions. And when this happens, we need to resist impulsive behavior, and work toward creating and maintaining an elevated stated of mind…the yoga state of mind, as Patanjali states in Yoga Sutra 1.33. We can begin practicing this concept on our mats, when we encounter poses that really challenge us. What do you do when you come across a pose that challenges you mentally and physically? Do you impulsively push yourself through it, only to find that you’ve ended up more stressed or injuring yourself? If you do, try to find your inner warrior to provide you with the strength to instead approach the pose with integrity, compassion and a loving state of mind. Try not to be so reactive with your mind. When things get hard, this is when we may find that our yoga practice, both on and off the mat, truly begins. It’s not easy, as I know all too well. I am notorious for reacting to everything without stopping and thinking through what the best course of action should be, as my husband and daughters can confirm. More often than not, when I don’t take the time to think things through, I end up regretting it. On the mat, I usually end up realizing that I’ve pushed myself too far in a certain pose, and I end up in pain. Off the mat…well, it runs the gamut! So this week in class, we’ll be working through a challenging standing sequence that will incorporate all three Warrior poses. This sequence will challenge our balance, our strength, and our flexibility. Your task is to take the time during this sequence to choose the variations for yourself that will allow you to stay calm, relaxed and joyful. I know you can do it. All you have to do is let go of your ego and go with the flow. October 20, 2012 in Health | Enter your password to view comments. In general, Sun Salutations are used to warm the body at the beginning of a practice. However, Sun Salutations can be a complete practice in and of itself. If you’ve been to one of my classes, you’ve probably heard me say many times that if you have time for nothing else, you can get a complete workout just by doing a few rounds of Sun Salutations. The wonderful thing about them is that you cover strength and flexibility all at the same time. And if you move one breath for every movement, you may feel cardio benefits as well. There are 12 basic poses that make up a Sun Salutation. These 12 or so poses linked in a series can can distribute energy (prana) throughout the system, in addition to strengthening the body and adding flexibility. There are many Sun Salutation variations you can choose from, and you just need to choose the one that resonates with you the most. If you are a beginner to yoga, try this variation as a start. If your preference is a more active, powerful style, try this variation instead. There are so many benefits to incorporating Sun Salutations into your practice. From a physical standpoint, they open and strengthen the front and back of the body. From an emotional standpoint, they help in bringing the body, breath and mind into balance. And from a prescriptive standpoint, they’ve been shown to help with low energy and poor circulation issues. This week in class, we’ll be playing around with making Sun Salutations our own. The wonderful thing is that you can add or remove any pose you wish, just as long as you’re moving mindfully and with your breath. In my opinion, THIS is our chance to truly explore and play. Have fun! Have you ever noticed how much your thoughts affect what you think of yourself? If you believe that you’re strong, you act like you’re strong. If you believe that you’re weak, you’ll act as if you’re weak. Why is that? Why do we let our thoughts about ourselves be what defines us? And if that’s how we are, why can’t we always think positively about ourselves? As many of you know, I’ve been working with doctors to diagnose what is causing a plethora of symptoms for me. It’s been over 10 months now, and after countless tests, we still don’t know what’s wrong. And over these months, especially during times when my fatigue is really bad and my pain gets bad, I definitely find myself getting really down on myself and thinking all kinds of negative thoughts. When I catch myself doing that, I do my best to try and turn it into something positive. After all, I am still able to function. I can go to work, and though I have had to modify what I normally do, I can still practice yoga, run and bike. And when I remind myself of these things, I truly feel like I can do anything. My yoga practice has certain evolved through all of this. What used to be a strictly powerful, active practice has morphed. Some days I have the energy to do that, but most days, I have to take it down several notches. I have become a really big fan of Yin Yoga, even though my body is so tight from whatever is going on inside. Even though I have a difficult time due to the tightness in my body, I always walk away from my Yin practice feeling open and free. Being in each pose for minutes at a time forces me to focus on my breath, my mind and my body….which translates into me not thinking about my problems for a nice chunk of time. Bliss, I tell ya! So next time you’re on your mat, when you come across a challenging pose, don’t think of yourself as weak or inflexible. Find the grace in each pose you do, because I promise you that it’s there. When you can do that, watch how your mind and attitude transform. You’ll start to think of yourself as graceful, open and free…and before you know it, it will move with you off the mat in countless ways. Have you ever been in a yoga class, where it seemed like everyone but you could do every single pose the instructor asked you to do? Lotus Pose, King Pigeon Pose, Wheel, Side Crow…you name it, and everyone but you seemed to be able to float seamlessly in and out of every single one of them? It happens to me ALL the time. Particularly with deep hip openers like Lotus…the bony structure that makes up my hips is simply not built for poses like that. Years ago, I forced myself to achieve Lotus because everyone else in the room seemed to be able to do it just fine. I was working on trying to tuck my left foot into my right hip crease. The moment I reached my typical stopping point, I kept pushing it, willing myself to make it there this one time. BIG MISTAKE! I immediately felt a sharp, popping sensation in my left knee, so I stopped and got out of it. But it was too late. The damage was done. And here I am over 6 years later and I STILL have issues with my left knee as a result. The point of my story is that I wanted to be like everyone else and do what they were doing. I was unwilling to admit that I had a limitation they didn’t have. What I should have done instead is to look for the opportunity. If I had really taken the time to look within, the goal of what I was trying to achieve was to release stress and tension from my hips, right? If I had been able to step outside of my ego, I would have realized that there were a plethora of other poses that could help me achieve the same goal…poses that my body could do safely, and which would allow me to not just open my hips, but to relax and enjoy the stretch. Do you have particular poses in your practice that do this to you? Poses that you know, deep down, are not meant for you but you go ahead and try them anyway? If so, how does it make you feel? If you’re like me, it probably leaves you feeling more stressed than you were before you got on your mat in the first place. I challenge you to opt instead for a “ready for new beginnings” attitude. Next time you’re in class (hopefully one of mine, of course), pay attention to your mindset as you’re asked to move into the more advanced and challenging poses. If you find you’re trying to move into a variation just because everyone else is, then maybe it’s not the right variation for you on that day. Make sure you’re looking for the opportunities each pose presents to you, for every pose you do offers opportunities if you look for them. Don’t let your mind limit your ability to explore new variations of a pose if that’s what your body is telling you it needs. Have fun with your yoga practice this week. After all, it’s YOUR practice, YOUR journey, so you have to make it what it needs to be for YOU. No one else can do that for you. And when you come across tough poses, look for the opportunities being presented. When you can practice this on your mat, you’ll find that it quickly moves with you into your life off the mat. I’d love to know what you find as you explore your practice in this way, so feel free to comment!